One question is, how many? 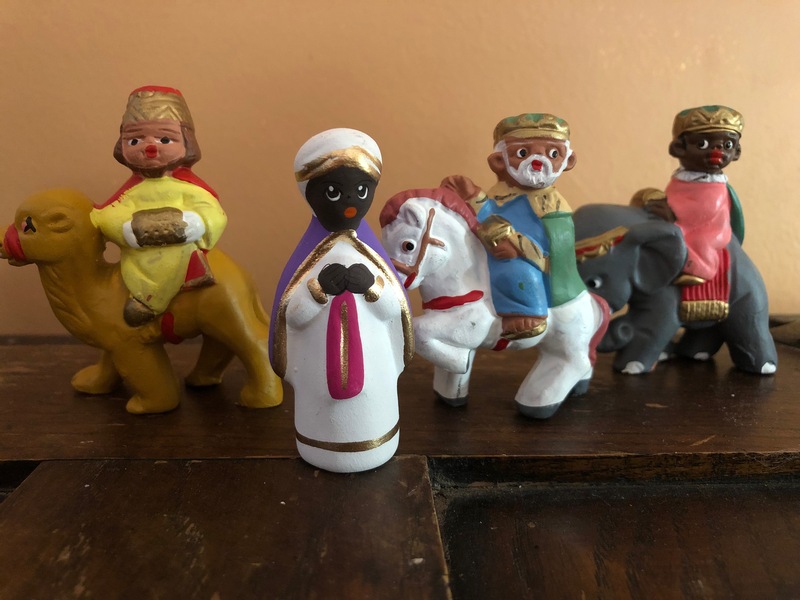 Last week Lin Manuel Miranda posted about his son’s celebration of La Víspera de Reyes, the eve of the Three Kings’ Day to social media. He introduced me to the charming Puerto Rican custom in which children leave a box of grass for the camels of the three kings who will bring gifts to children on that day. 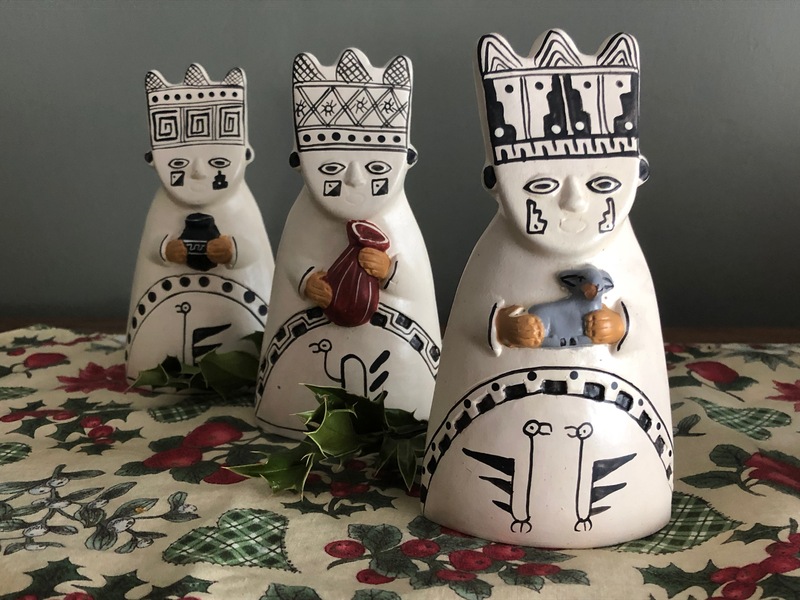 Statues of the famous kings began appearing in nativity scenes in churches the same day and (if they weren’t already there) in the private homes of people who celebrate religious Christmas. 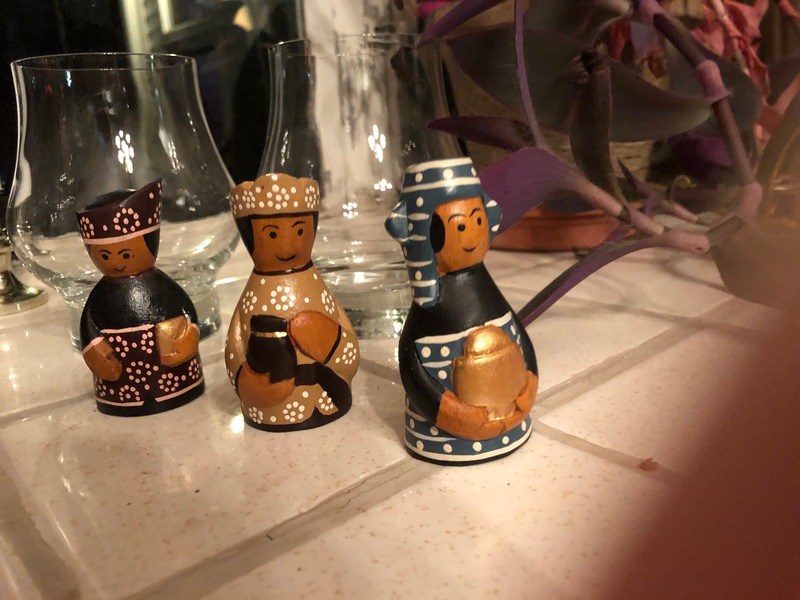 The iconography of the Three Kings intrigues me. We always learn more about the era in which an image is created than we do about the subject of the graphical image. Sometimes the evolution of the symbols and art motifs are more interesting than the story they tell. The three “kings,” are a good example of that. Some men came from the east. They were “wise,” and observed the stars. They went to Jewish authorities for direction. They gave gifts specifically of gold, frankincense, and myrrh. Who were they? The passage leaves many questions. The mention of a star has led to speculation they were astronomers. The word magoi (Greek) or magi (Latin) is believed to be the plural of a Persian word for a priest/astrologer/sage, causing some scholars to identify them as Zoroastrians. Others to dispute that. An eighth century manuscript in Syriac, The Revelation of the Magi (which some scholars believe is a copy of a work that dates to the second century) purports to be the first person account of the journey. It puts their origin in the mythical land of Shir which may—or may not—be China or Tibet. Justin Martyr suggested in the second century that they were pagans who converted immediately upon meeting the savior. Some Christians who take scripture literally find it offensive to think superstitious pagans may have attended the birth of Christ, but they miss the point of the passage. Matthew, however, appears to be deliberately making a statement that the savior’s birth mattered not just to the Jews, the true believers, but to foreigners as well. He came to save all men, or as the gospel says a bit later, as a “light of revelation to the gentiles” as well as “the glory of his people Israel.” Matthew did not specify which pagans, however. So much for how little we know. How are they pictured? 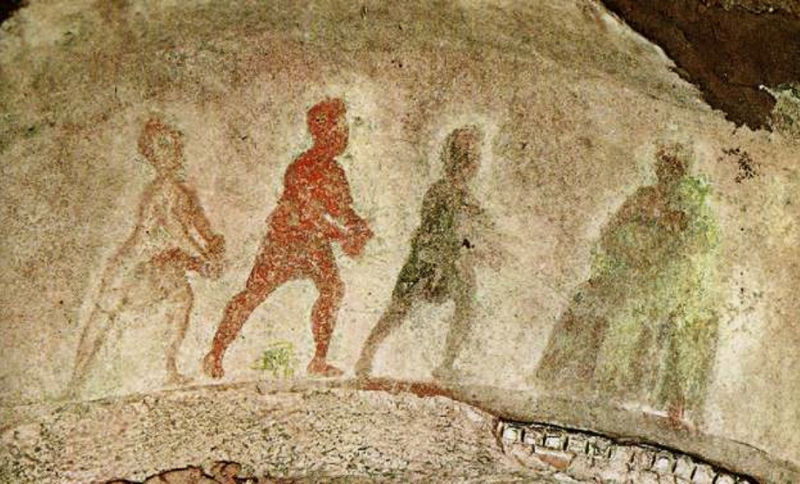 While some early Christian are depicts 2, 4, or 6 figures, the earliest known picture of men presenting gifts to mother and child is in the Catacomb of Saint Priscilla in Rome and dates to the second century. 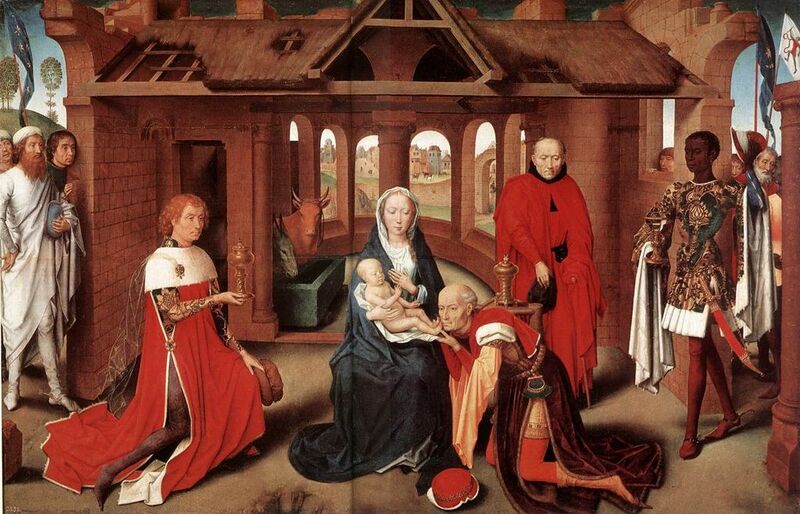 It shows three hatless figures carrying gifts and making obeisance to a seated Madonna. The most practical reason to depict three figures is that the gospel mentions three gifts—three gifts, three givers. In addition, the figures are often very similar to those of the three young men in the furnace from the book of Daniel, symbols of steadfast faith. Later writers read into that other religious symbolism such as a reflection of Trinity. Depictions of the event solidified around the number three. As Europe moved from the cosmopolitan world of the Roman Empire to the medieval world of lords and vassals, kingship mattered. Medieval representations often took the form of stone carvings on and around the great cathedrals or in illuminated manuscripts. They came to be shown with elaborate garments and crowns such as contemporary European lords would wear. 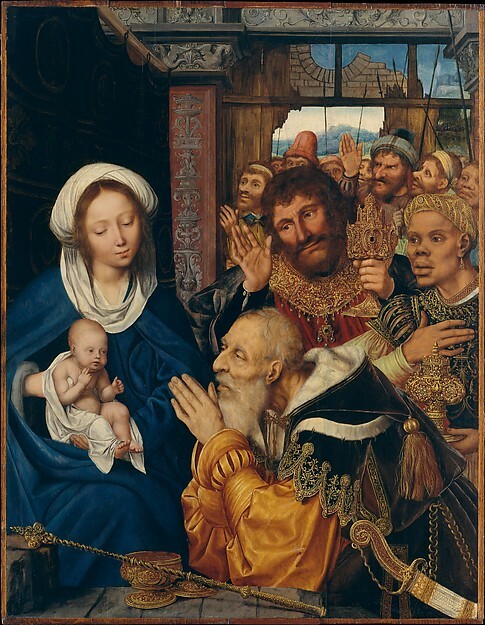 By the Renaissance, The Adoration of the Magi had become a firmly established motif: three kings making homage to a mother and child. Although they are often shown with heads bared in respect, they sometimes wear crowns, always wear sumptuous clothing, and frequently have massive retinues. 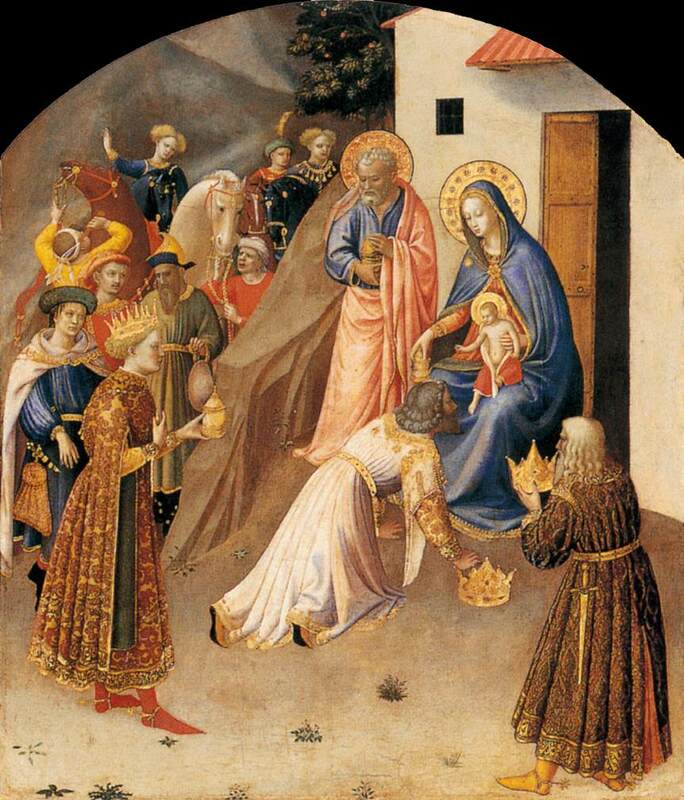 Fra Angelico has them laying their crowns aside. In Italian Renaissance paintings they appear dressed as Italian princes and the event is often set in a Renaissance era palace. Where are they from? Not Italy. As we’ve seen the gospel says they were from “the east.” In the early 8th century the Venerable Bede (the one who wrote the Ecclesiastical History of the English People) wrote that they must represent the major parts of the world: Asia, Africa, and Europe. That led to the frequent inclusion of one African king in Magi paintings (though of course in contemporary European dress most often) and to the inclusion of animals supposed to be from the three continents, horses, camels, and the occasional elephant. Rembrandt’s version includes a portly eastern potentate being shaded with a massive palm fan. By the nineteenth century, Magi paintings began to show more fanciful views, with costumes that reflected Victorian fascination with the Middle East, India, and even China, and less interest in the importance of kingship. In our own era worldwide cultural versions of the scene can be found. In many, the men are depicted with symbols of leadership indigenous to the artist’s people. Some common motifs remain. Where the visitors are portrayed, there are always three of them, and they always carry gifts. The gifts, however, sometimes vary and represent things each culture might value. There has been a rich outpouring of such art, some of which has found its way into my own home. 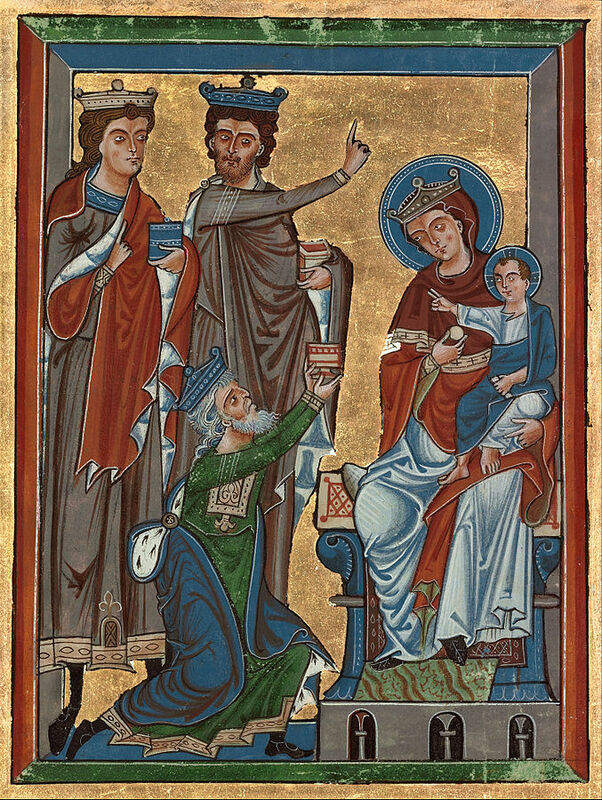 Whether you celebrate Three King’s Day (or Epiphany as it is called) or not, take a look at depictions of the Adoration of the Magi. You will learn something about the cultural context and values of the artist and the era in which he or she lived, and perhaps find insights into evolving ideas about power, prestige, and the need to bend a knee now and then. Caroline Warfield’s passions are family, travel, and writing. It should be no surprise that the first two fuel her stories. She writes historical romance in which she nudges her characters to explore the riskiest territory of all, the human heart. In addition to History Imagined, she is a regular contributor to The Teatime Tattler, a blog in the shape of a fictional nineteenth century scandal sheet. Excellent research and interesting story. Thanks. Excellent article on a fascinating subject, Caroline! A fascinating read on a mysterious subject. Thanks for sharing!